NO SWEAT™ reusable insulation wraps come with a 1" thick flexible fiberglass insulation blanket that is used to insulate the installed valve. The outer cover is made of DuPont Tychem® QC. 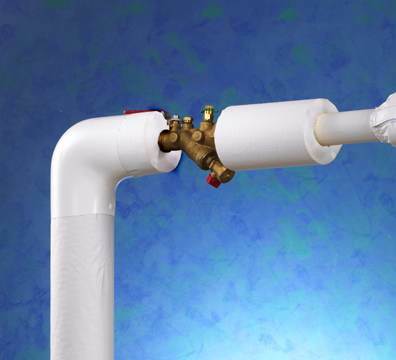 It easily stretches around the insulated valve and is secured with a Velcro closure. No Sweat™ reusable valve covers provide worry-free performance. Length of valve, including handle in the ON position plus overlap. Allow for a 2" overlap on each end. When ordering, use chart below for Side a, then choose desired length. Example: Pipe diameter 3/4" x 1" thick insulation x 10" long use wrap #2b. #1a - 4" #2a - 8" #3a - 10" #4a - 12" #5a - 16" #6a - 16" #7a - 22" #8a - 22"
#1b - 6" #2b - 10" #3b - 12" #4b - 14" #5b - 18" #6b - 22" #7b - 32" #8b - 32"
#1c - 8" #2c - 12" #3c - 14" #4c - 16" #5c - 20" #6c - 32" #7c - 42" #8c - 42"